On Arran one of our most widespread warblers is the Willow Warbler. In the breeding season its song described as a “melodic rippling phrase that rises quickly before slowly dying away” is a feature of many island walks. Where are the Willow Warblers at this time of year? The short answer is far to the south, heading beyond the Sahara to mainly the Ivory Coast and Ghana. Some journeys can be more than 15,000km and, based on ringing data, the journey time can take eight to twelve weeks. The Willow Warbler is not much bigger than a Wren and weighs about 8g. It is a delicate little bird adapted to feeding on insects from bushes. With its apparently weak and slow flight, it undertakes one of the longest and arduous journeys of any land bird involving long sea and desert crossings where it cannot feed. The birds from northern Europe have to cross the Mediterranean Sea and the Sahara desert. Without food or water there is the risk of starvation or dehydration, as well as the hazards of predation and weather including adverse winds. How does such a small bird manage this journey? Briefly the answer is by a number of remarkable adaptations. The Willow Warblers undergo two complete moults a year to try and ensure that their feathers are in the best condition for the journey there and the journey back. At times of migration, Willow Warblers put on extra body fat and other reserves for use as fuels, the amount depending on the type of journey. When birds migrate over favourable terrain, they tend to progress by short flights, each lasting several hours, using relatively small amounts of fuel which are replaced during the daily periods of foraging. But when birds migrate long distances over inhospitable areas, they accumulate much larger body reserves, able to sustain them for several days and nights without feeding. The accumulation of such large body reserves may take small birds one to three weeks of intensive feeding and before departure individuals may have more than doubled their normal weight. Often migrating Willow Warblers move at night leaving time during the day to feed. Migrating birds are also able to reduce organ size of the liver and the gut – less baggage to carry on the flight. The fact that nutritional organs are not fully functional on arrival after a long flight may also explain why some migrants on reaching a stopping site do not appear to feed. They are in flight mode rather than feeding mode and need to reconstruct their digestive machinery again. For a bird like the Willow Warbler, it is thought that crossing the Sahara alone takes around 30-40 hours of flying time. This will vary depending on, for example, wind strength and direction. Nocturnal flights between oases, while a helpful strategy, would considerably lengthen the time of crossing. Whatever the conditions, crossing the Sahara without food or water seems a staggering achievement for birds weighing less than 15g fully fuelled at take off. 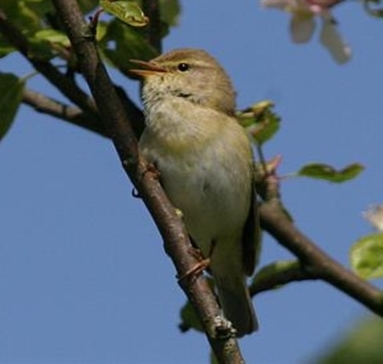 The Willow Warbler is just one example of many birds that migrate. Hopefully a sufficient number of these birds will continue to survive these hazardous journeys to grace our island again come the spring.